Book 3 of 100 on the Great American Read list. A few years ago, I decided to read the classic American children’s books that my bookseller colleagues had read when they were young and when I lived in another country. I began asking around for what should be on the list. It varied considerably, E B White and Lloyd Alexander, A Cricket in Times Square and Tuck Everlasting. But one title that came up again and again was A Tree Grows in Brooklyn. My female friends were especially enthusiastic, as one said “I’m jealous that you get to read it for the first time”. Well, now I’ve read it and I know what she means. This is the story of Francie Nolan, as she grows up in Brooklyn during the first two decades of the twentieth century. Her family are poor, her father is a drunk and her mother is harried but proud. She has a brother who is her protector and friend and later she has a baby sister. 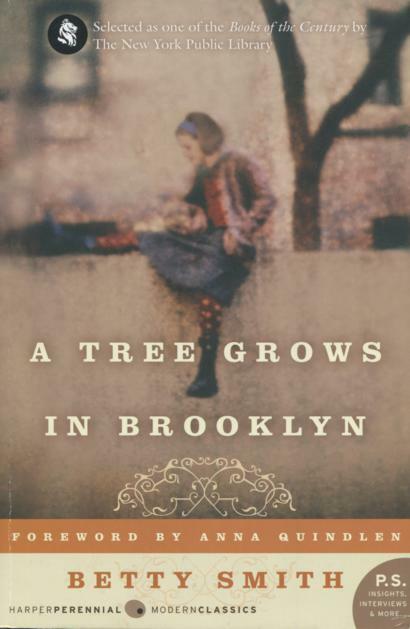 A Tree Grows in Brooklyn is her impressions of the world and her journey toward understanding more of it. The writing is extraordinary, one particularly atmospheric passage evoked my early memories of the local public library, a Victorian building not unlike a church which, like Francie, I treated with greater reverence. While I was reading A Tree Grows in Brooklyn I repeatedly found myself stopping to cry or write down a perfectly crafted sentence. I also enjoyed looking up the slang and archaic language 23 Skidoo was a particular favorite. What I find extraordinary is that the reader gets a glimpse into the heart of every female character in the book. Francie has a wild aunt, a funny aunt and an aunt who is a nun and I loved them all at least a little bit. The women talk like actual women, the hazing Francie gets at her first factory job is a masterclass in female-centric politics. And I never found myself questioning a female character's motives, because the women are complex but open books. Why is this book on the list? It was published in 1943 and although it never won any awards, it’s been a popular read ever since. There are only two bestselling books from the 1940s that made the 100 Great American Read list. One is A Tree Grows in Brooklyn and the other is The Grapes of Wrath, although that stayed in the top ten for fewer years. At various times A Tree Grows in Brooklyn was a movie, a musical and a tv show. It was even printed as an Armed Services Edition during the Second World War. I think another secret of the success of this novel is the target audience, because A Tree Grows in Brooklyn is a YA Book. Long before anyone thought of young adults and possibly before teenagers were invented, here is a book which covers the life of a girl between the ages of eleven and sixteen and a half. And it isn’t a charmed life either, it’s hard, angry, bloody and sad. Francie struggles against her upbringing just as it informs her aspirations. She must find out who she is, without rejecting her family. Exactly like the heroine of every YA novel published today. And Francie is a reader, a prodigious reader, reading is her escape, her education and eventually her job. There is nothing that young readers like better in a character than a bookishness to match their own. A Tree Grows in Brooklyn is also the most American book I’ve read to date. I began this undertaking to better understand American culture, I didn’t expect to find everything right here in the third book I read. The whole Brooklyn community is a mess of immigrants, religion plays a huge role, but so does hope and aspiration. Francie counts every penny when she’s poor and tells us about every dollar when she starts working. There’s even a gun and some expectedly corrupt politics. This is America. But I might not even stop there. It’s also a semi-autobiographical story, told 30 years after the fact. We must assume that it is at least a little rose-tinted. The way it should have been. So what does that tell us about America’s pride in it’s white working class and the American Dream. Perhaps that it never really existed? I loved this book. I'm glad I've read it and I look forward to reading it again.